Eyes are complicated organs, full of nerves, muscles, soft tissues and blood vessels that all work together to provide what many consider the most valued of the five senses. Sight is used in almost everything we do, so it’s no wonder people want to have their vision perfected. But since eyes are so complex, it is not always easy to determine the precise prescription necessary for 20/20 vision. That’s where an auto refractor comes in. 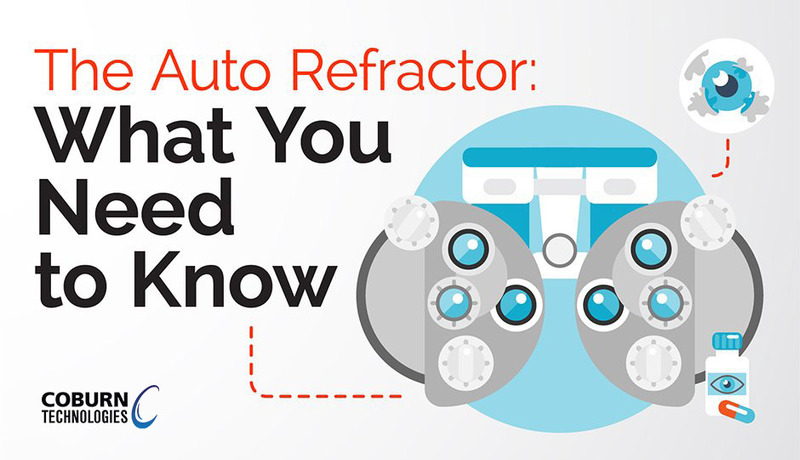 The easy answer to the question, “What is an auto refractor?” is that it is a machine used to determine an individual’s prescription by measuring how light is affected as it reflects through the eyeball. Auto refractors are quick and painless for the patient and they provide an excellent baseline for an ophthalmologist to determine the correct eyeglass or contact lens prescription. At Coburn Technologies, we carry several different auto refractors, all of which are also keratometers. This simply means that in addition to determining the correct prescription, the machine will also measure the shape of the cornea. This measurement is crucial for diagnosing certain eye conditions, such as astigmatism or corneal distortion, and it is especially helpful for fitting contact lenses. Here is a quick look at our auto refractor/keratometer lineup. The Huvitz CRK-7000 Auto Refractor is a precise machine that features an auto-start mode. It can sustain fogging throughout several measurements, making it perfect for children or any patient that has a hard time fixating on a target chart. The Huvitz HRK-7000A Auto Refractor is a more advanced auto refractor/keratometer that features a Retro-Illumination Mode to help the ophthalmologist detect abnormalities with the lenses, scratches on corneas, or cataracts. This auto refractor can also determine the sphere, cylinder, and axis measurements with precision. The Huvitz HRK-8000A Auto Refractor is the first auto refractor that offers a function that fits contact lenses. It allows the ophthalmologist to see the fluorescein liquid in blue illumination, as it analyzes the eye and simulates a lens fitting. This auto refractor features three-dimensional eye tracking and provides automatic recommendations. The Huvitz HRK-9000A Auto Refractor is a high-end auto refractor/keratometer the features cutting edge technology to offer both the patient and the ophthalmologist an extraordinary experience. One of a kind, the HRK-9000A offers a Meibomian Gland Analysis function and Tear Film Break Up Time (TFBUT) measurement. Other features include Wireless Communication, full compatibility with all EMR Systems and Full Three Year Warranty. At Coburn Technologies, we feature the best auto refractors/keratometers on the market, all with the desire to make the eye exam process more efficient and easier on the patient. To find out more, contact us today.